January 2012 is almost over! Time flew by so fast I can't keep up! Do you feel the same? Today, my brother will be leaving the country again after a wonderful week vacation for the Chinese Holidays. I feel sad but at the same time, I'm thanking God for the time we spent as a family! I'm sure there will be more bonding moments between us! To prepare myself for the Month of the Hearts, I will be sharing a nail art tutorial with me Getting Back That Romance! I've done several drawings from cute to crazy! Today, I will be sharing a simple nail art tutorial that is friendly for office ladies! Apply a base coat of your choice to prevent your nails from yellowing. I chose a light pinkish shade from Wet N' Wild 205A Sugar Coat. Applied 2 coats and let dry. With a hot pink shade from Etude House Wannabe Style Nails, I created a diagonal line and filled in the upper tip of the nail just like on photo below. Note: It is very important that the base coat is completely DRY so both polish won't mix up. With L.A. Colors Art Deco Polish in White (guys! I found another place where you can buy this! Do wait for Eureka Moment soon! ), create 3 wispy lines. This step is optional but if you're like me who wants to create an illusion of a sparkly nail, I used L.A. Art Deco Polish in Silver and create the same wispy lines just below the white ones. I applied diagonal hot pink tip on all nails except the ring finger, instead, I used Matte White polish and let dry. With the same Hot Pink polish from Etude House, dot 3 dots in a triangular way. Dots doesn't have to be perfect. With the thin brushed Matte Brown Polish which I bought from Daiso, create branches. You can attach rhinestones as petals but I chose to do it simpler by picking my Mini Bourjois gold sparkly polish and create a dot in between the petals. Another optional step and you can create random lines with the sparkly silver polish. Once the nail art designs are COMPLETELY dry, top with your favorite top coat. Romance is back and let's welcome February! I hope the combination brightened up your day as it did to me :) Happy start of the week! This is super cute and pretty! CUUUUUTE! nikki youre soooo cute always! that nail polish from EH is gorgeous! love the color! 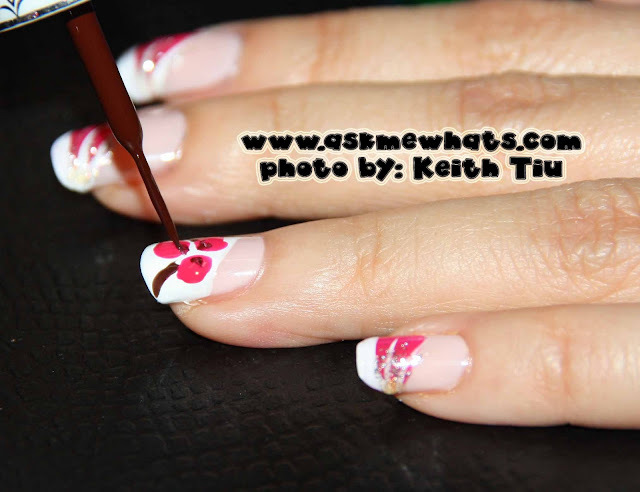 love your nail art too! I think I saw that Art Deco in a mall near our place? Re: Art Deco, yup! they are widely available locally na! love this esp the ring nail! simple and sweeeeet ;) feels like i am still on CNY mode and its valentines already? That's so cute and sweet! Great mani you have there Nikki..I love it..^_^.. Thank you, coming from you, I am very happy!